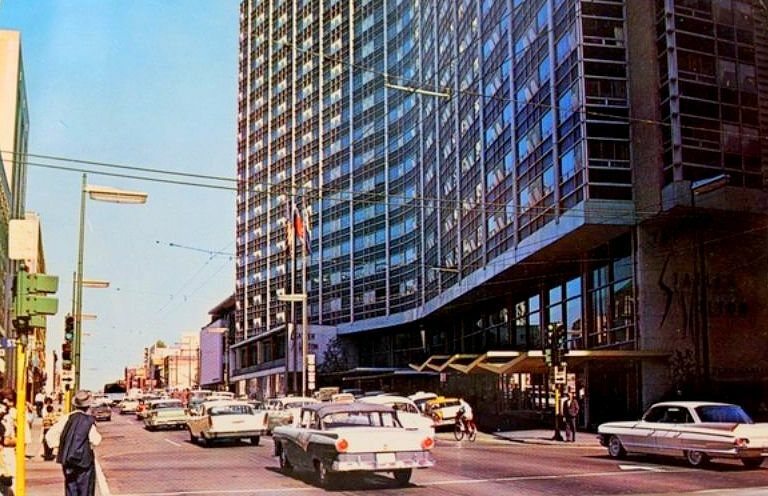 Great shot of the Statler Hilton, looking east down Commerce — looks both hot and cool. Hi, folks, we’re having a wonderful time. This is beautiful country. We’ve been to San Antonio for a couple of days. Saw the Alamo, also San Jose Mission and went to Mexico. The children are darling and we’re having fun spoiling them. Love to all — Helen and Walter. Tourists sure write a lot about San Antonio on picture postcards of Dallas…. Great news! After decades of that beautiful building sitting empty, it has been announced that it will finally be coming back to life — and the Hilton company is going to be part of it. More here. See a current view of the same corner on Google, here. Look at the white 4 door sedan in the lower right hand corner of the picture. Is that a 1957 Cadillac? A person on Facebook commented that it was a 1961 Cadillac Sedan de Ville. I misread the postmark on the back of this postcard as 1956. But on closer examination, it appears to be 1960-something. This is probably a photo taken in the early ’60s. The one great history and story is the Hotel business and has been since the 1850s when John Neely Bryan opened up one hotel not far from the Cruthchfeild house and from then on a stage or horse or Rail Road train then car and cabs made this city an invite too the hotel,…. Paula the industry of your vissions of the good old days are great lines here please keep it up…..